@roro...Yep, Pegasus is cool. Also McKinley's other books are well-crafted and drool-worthy. Bump it up the tbr pile! I need to read Daughter of Smoke and Bone! Ugh! 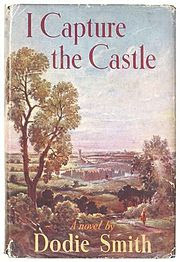 I've never read I Capture the Castle, but those first 3 books are some of my fave first lines, wow!! "Mrs. Rachel Lynde lived just where the Avonlea main road dipped down into a little hollow, fringed with alders and ladies' eardrops and traversed by a brook that had its source away back in the woods of the old Cuthbert place; it was reputed to be an intricate, headlong brook in its earlier course through those woods, with dark secrets of pool and cascade; but by the time it reached Lynde's Hollow it was a quiet, well-conducted little stream, for not even a brook could run past Mrs. Rachel Lynde's door without due regard for decency and decorum; it probably was conscious that Mrs. Rachel was sitting at her window, keeping a sharp eye on everything that passed, from brooks and children up, and that if she noticed anything odd or out of place she would never rest until she had ferreted out the whys and wherefores thereof." I need to read Smoke and Bone but it looks BRILLIANT. And I TOTALLY agree about Near Witch! the near witch and daughter of smoke and bone are both on my tbr pile. so excited to read both. my sister loved near witch and has been urging me to read it. @sara...that is truly an intriguing opening and I must investigate. I love the opening lines you chose. I'm reading Miss Peregrine's Home for Peculiar Children, and it has a great first line: "I had just come to accept that my life would be ordinary when extraordinary things began to happen." I also like the beginning of The Voyage of the Dawn Treader: "There was a boy called Eustace Clarence Scrubb, and he almost deserved it." I seriously can't wait for Starters by Lissa Price! I've only read the first 50 pages of this book, but once I get my hands on an advanced copy I guarantee I won't be able to put it down! I've a terrible memory, but I do love the openings of DoSAB and The Near Witch. The Night Circus has a good one, too: "The circus arrives without warning." Divergent: "There is one mirror in my house." Ooo, those are great examples! Hm, we haven't heard of that one. Thanks for the heads-up! Nice! So simple, and yet so intriguing. The start of 'Daughter..' was so perfect! I really loved those little lines in between the sections.